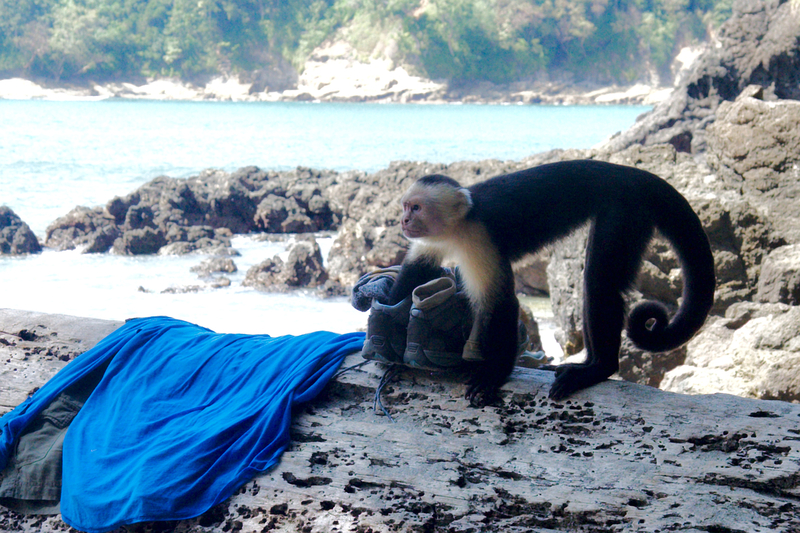 After our Jaco Jungle Jam stay, we headed south to Costa Rica’s Manuel Antonio National Park. We had reservations for an AirBnB apartment close to town (we thought). As it turns out, Costa Rica does not have street names and addresses. After spending three fruitless hours searching for our place, we gave up. No one answered any of the three phone numbers we had. No one knew where the mythical Colina Molita Road was. At a hotel on the main drag, a reception clerk who actually knew the woman owner helped us tremendously by also trying to message her. Finally, he called around and found us a reasonably priced hotel nearby. At that same time, a car pulled up looking for us. The apartment owner, who was out of the country, finally got the messages and sent a car to look for us and bring us to the apartment. 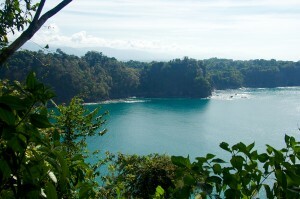 The apartment was okay, but with Costa Rica’s severely cut terrain, the road there was almost a mile off the main drag and had a quarter-mile of 50% grade down hill and up hill. Uh, no thanks. Deena’s knees were not smiling at the prospect of walking that each day. We stayed at the hotel. Lesson learned: Costa Rica does not have street names and addresses. If you rent rooms with AirBnb, make sure the owner sends you GPS coordinates. At our next AirBnB stay in Escazú, the owner answered the phone and gave the taxi driver explicit instructions. It went something like this: “Exit at the construction materials store, go toward the cement plant that’s no longer there for a couple kilometers, then it’s the driveway on the left about fifty meters before the bus stop with the big tree. It’s the yellow house but now we’ve painted it green.” How’s that for an address? We spent a day in Manuel Antonio Park where we saw some fascinating plants and beautiful vistas of the Pacific Ocean.1 The monkeys there are apparently well versed in scalping tourists. We watched one run up and grab a whole package of crackers right out of a woman’s hand who was trying to make a cheese and cracker snack on the beach. They’re fast when they want to be, and not afraid. Let me see if this tourist left his wallet in his shoe. Previous PostAttack of the White-Nosed Coati Army! !Next PostDo Hummingbirds Hum Because They Forgot the Words? Actually, it was the Gulf of Nicoya near the mouth to the Pacific. 2 Jewish women in New York. One says, "Do you see what’s going on in Poland?" The other says, "I live in the back, I don’t see anything."